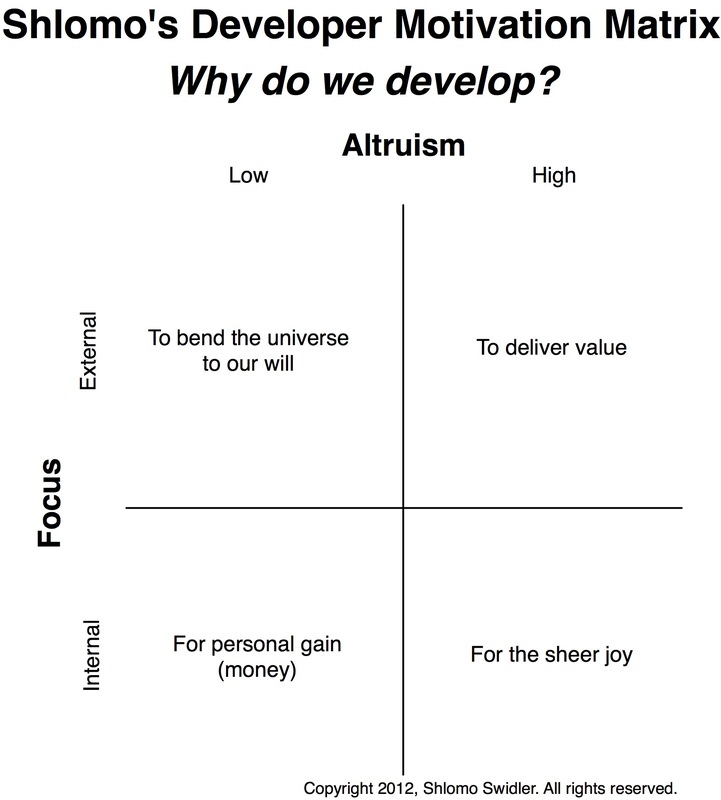 Individual developers can be motivated more or less altruistically. Individual developers can also be focused on the external manifestations of success – such as appreciative customers – or on the internal manifestations – such as more power or money. The diagram above is not a judgement of “better” or “worse” motivations – it is simply meant to capture two personality factors and their expression among individual developers. Also note that developers may have different motivations at different times, or even simultaneously in combination. Just as individual developers can have varying motivations, organizations can also be more or less altruistic, and focused more internally or externally. Internally focused organizations spend an undue proportion of their energy and resources doing work (or inventing work to do) that will not be visible to the outside world, while externally focused organizations measure their results based on their effect on the outside world – market share, profit, and customer satisfaction. Where do you rate your organization on the above diagram? Most business leaders want organizations firmly motivated by providing value to the customer, and software businesses are no different. Developing software is all about delivering value. Your software development efforts can only provide value if they are successfully delivered to the customer – and in today’s “as-a-serivce” world, that value is constantly provided via the internet. This means that you should spend significant effort ensuring your customer can actually reach your service to receive the value. It means automating your deliveries. It means measuring and improving your delivery speed and success rates. It means involving your customer early on so that you know the value they seek and so you can provide it. It means making sure all your teams work together to get this to happen. Because ultimately, it means a developer’s job is not finished until the customer has derived value. Next post: Wanted: Change. Generous Reward.